16639 EA ALGERIA (1950) de Foucauld*. Gen. Laperrine*. 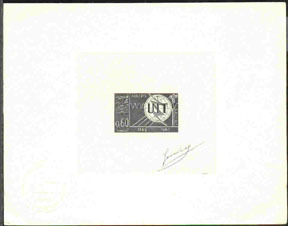 Die proof in black signed by the engraver CORTOT. 50th anniversary of French presence in the Sahara. Scott No B60, Yvert No 284. Rare! 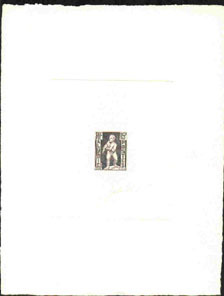 15339 EA ALGERIA (1952a) Child with eagle*. Die proof in black signed by the engraver. Statues in Cherchell. Scott No 242, Yvert No 290. Rare! 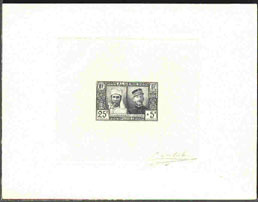 15340 EA ALGERIA (1952b) Isis*. Die proof in black signed by the engraver. Statues in Cherchell. Scott No 243, Yvert No 291. Rare! 16641 EA ALGERIA (1952) War memorial*. 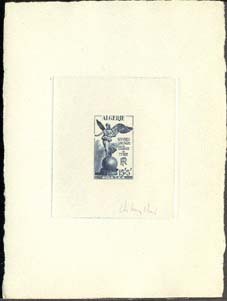 Die proof in black signed by the engraver DECARIS. Scott No 246, Yvert No 295. Scarce! 16642 EA ALGERIA (1952) French & Algerian soldiers*. Camel*. 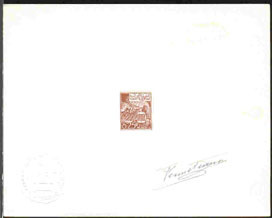 Die proof in blue signed by the engraver DUFRESNE. 50th anniversary of establishment of Sahara Companies. Scott No 249, Yvert no 302. Rare! 18698 EA ALGERIA (1953) Victory of Cythera*. 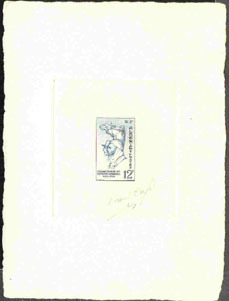 Die proof in bluish-black signed by the engraver MAZELIN. Surtax for Army Welfare Work. Scott No B70, Yvert No 307. 7727 EA ALGERIA (1955) Tipasa*. Chenau mountains*. Roman ruins*. 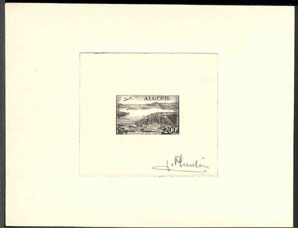 Die proof in black signed by the engraver SERRES. Scott No 263, Yvert No 327. 3884 EA ALGERIA (1957) Beni Bahdel dam*. 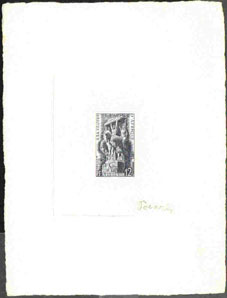 Die proof in black signed by the engraver PHEULPIN. Scott No C12, Yvert No PA14. Rare! 15023 EA ALGERIA (1964) Tractor* plowing fields*. 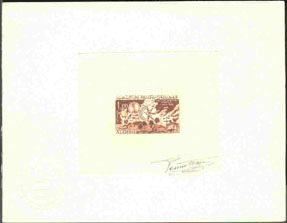 Die proof in brown signed by the artist FENNETEAUX with embossed seal in corner. Scott No 324, Yvert No 393. 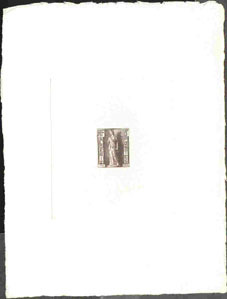 Die proofs of stamps produced by typography are very rare! 17573 EA ALGERIA (1965) ITU emblem*. Die proof in black signed by the engraver. Scott No 339, Yvert No 409. Rare! 16627 EA ALGERIA (1966) Weather balloon*. Compass Rose*. Anemometer*. Die proof in brown signed by the engraver FENNETEAUX. World Meteorological Day. Scott No 351, Yvert No 421. Rare!